There’s no rule stating that you have to pack on extra pounds during the holiday season so let’s go ahead and skip that tradition this year! Start the TLS 21 Day Challenge and lose weight before you even have a chance to gain it. It takes 21 days to form a habit- good or bad. Begin a new, healthier lifestyle and learn better habits that will help you resist holiday temptations such as eggnog, gingerbread men, and fudge. Read on to learn more about the TLS 21 Day Challenge and how it can help you lose weight now to avoid holiday weight gain. TLS Weight Loss Solution encompasses low-glycemic impact eating, body composition, supplementation, and education; offering extensive, custom-made plans that cover everything you’ll need to get fit and trim. 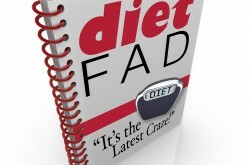 This inclusive approach will assist you in achieving your weight loss goals and leading a new, healthy lifestyle. 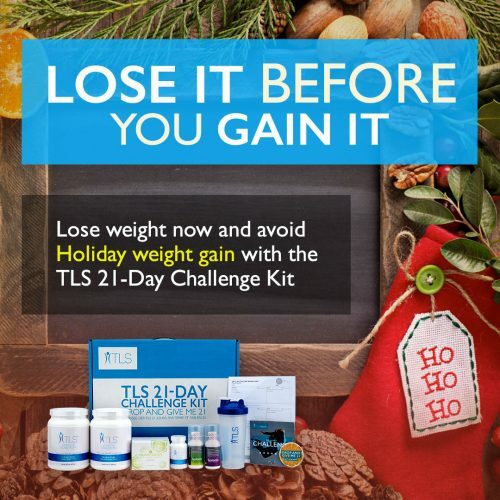 With the TLS 21 Day Challenge Kit, there is NO COUNTING POINTS OR CALORIES! Just like the Challenge, getting started is quick and uncomplicated. Follow these five easy steps to start your own Challenge! Purchase the TLS 21-Day Challenge Kit. Our highly-acclaimed supplements will enhance your weight loss efforts and give you the energy you need to succeed. Each kit includes: NutriClean 7-Day Cleansing System; TLS CORE; Isotonix OPC-3 (30 Servings); Isotonix Multivitamin (30 Servings); 2 TLS Nutrition Shakes – 1 Vanilla, 1 Chocolate; Challenge Guide; Tracking Sheet; Shaker Bottle and Button. Invite your Friends & Family. 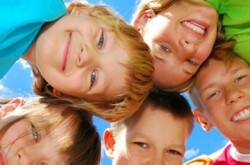 Ask your friends and family if they want to join you on the TLS 21-Day Challenge! Set your Goals. Set your weight management goals and share them with the world! It’s been proven that people who use social media during weight loss programs lose more weight. Connect with us on social media on Facebook, Twitter, Instagram and Pinterest. Get Started. Lose that extra weight in just 21 days!